How much does it cost to travel to Acadia National Park? How much money will you need in Acadia National Park? $138 is the average daily price for traveling in Acadia National Park. The average price of food for one day is $36. The average price of a hotel for a couple is $154. Additional pricing is in the table below. These average travel prices have been collected from other travelers to help you plan your own travel budget. How expensive is Acadia National Park? How much money do I need for Acadia National Park? Located in the U.S. state of Maine, Acadia National Park encompasses much of Mount Desert Island, including smaller islands just off the Atlantic Coast. Once inhabited by the Wabanaki people, the region was a hub for seasonal fishing, hunting, and gathering berries, clams, and other shellfish on the coast. Acadia officially became a National Park in 1919, though it wasn't named Acadia until 1929 in honor of the former French colony. Since then the park and its wildlife have been carefully preserved with the exception of carriage roads with granite bridges and two gate lodges which were designed under the philanthropy of John D. Rockefeller so that visitors might access the park more easily. Today the park consists of more than 47,000 acres with some 40 different species of wildlife, many native plants, and opportunities for outdoor activities. Being a national park, some of the most notable features of the region exist in the beauty of its natural scenery. Acadia's landscape is marked by woodland, rocky beaches, and glacier-scoured granite peaks like Cadillac Mountain, the highest point on the United States' East Coast. Any time spent in the park might lead visitors to see some of the local wildlife which consists of critters like red and gray squirrels, chipmunks, white-tailed deer, moose, beaver, porcupine, muskrats, foxes, coyote, bobcats, and black bears. On the coastline and smaller islands, it is also common to catch sight of marine animals like whales, seals, and seabirds. From the tallest mountain, through dense sweeping forests, to Maine's rugged coastline and the islands skirted by waves, Acadia National Park embodies a landscape teeming with natural beauty, native wildlife, and the lure for adventure. Bar Harbor is the home base and hub of activity neighboring Acadia National Park. The streets of Bar Harbor are lined with specialty and shops and galleries, featuring handcrafted Maine items from jewelry to maple syrup, as well as the works of local artists. There is a selection of outdoor outfitters to gear you up for any adventure from hiking in Acadia to kayaking on the coast, many stores selling practical Maine clothing, and yet others that feature designer trends. Antique shops will take you on another kind of adventure, while specialty stores will reel you in with the lure of kitchen accessories, tea supplies, soaps, candles, and other quirky gifts. The town is also home to many historic buildings that still stand today, giving Bar Harbor the charm of another time and place. Some of the most popular outdoor activities in Acadia include hiking and biking along trails or carriage roads, bird and wildlife watching, and mountain climbing. As mentioned earlier, these roads were financed by John D. Rockefeller and stretch about 57 miles. They are motor-free and are intended for the use of hikers, bikers, horse riders, and horse-drawn carriages. Some within the park are open for cross-country skiing and limited snowmobiling in the winter months. Park Loop Road offers the easiest way to see the sights by car with many parking lots and pullover points along the way. By foot, Acadia has over 120 miles of hiking trails and paths that range from a category of very easy to strenuous. Some of the more popular hikes include Beehive Trail, Gorham Mountain Trail, Precipice Trail, and Great Head Trail. Other notable features of Acadia include Schoodic Peninsula, Thunder Hole, and Otter Cliff. While visitors are sure to find Maine's staples (clam chowder, lobster rolls, and blueberry pie) and so much more in the neighboring town of Bar Harbor, Acadia National Park does have a single gem of its own. The Jordan Pond House Restaurant sits with a view overlooking Jordan Pond and the North and South Bubble Mountains. The tradition of having tea and popovers with this view was first established in the late 1800's, though the original restaurant was rebuilt due to fire. The teahouse is open seasonally for lunch, tea, and dinnerreservations are recommended. Burning Tree Restaurant is another popular restaurant on the outskirts of the park. A casual eatery in Otter Creek, it is a great stop for well-spice locally sourced seafood. A greater variety of cuisine can be found in Bar Harbor Bar which features anything from pub fare and farm-fresh cuisine to international flavors and fine dining al fresco. In regards to public transportation, Island Explorer is a shuttle system that features eight bus routes linking hotels, inns, and campgrounds with destinations in Acadia National Park and neighboring village centers of Bar Harbor. Park Loop Road is the main avenue for navigating Acadia. 27 miles long, the road begins at the Hulls Cove Visitor Center (near Route 3 on the northern side of the island) and connects the Park's lakes, mountains, forests, and rocky coast. By air, the nearest airport is Hancock County-Bar Harbor Airport, located 12 miles from Bar Harbor and Acadia with a daily scheduled airline service to and from Boston. Bangor International Airport is located about 50 miles away and is serviced by Delta Air Lines, US Airways, and Allegiant Air. By car from Boston, follow I-95 through to Bangor (exit 182-A, 395), then pick up Route 1A to Ellsworth and follow Route 3 to Bar Harbor. Acadia National Park makes up the area surrounding Bar Harbor. 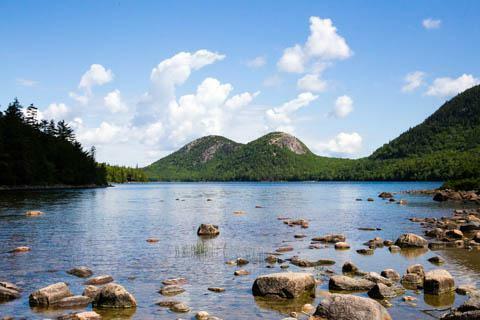 For more information, check out this amazing guide to Acadia National Park.